Time of the dry, tasteless protein bars is over! 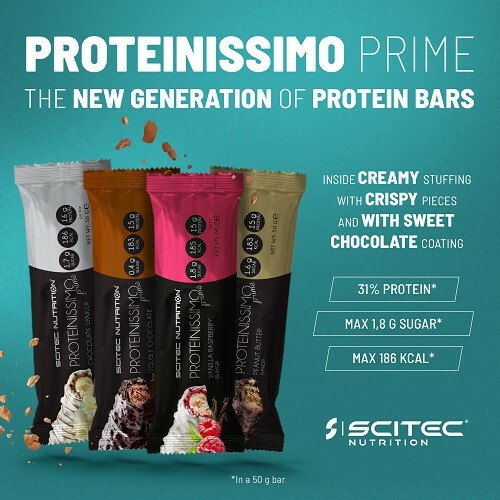 Proteinissimo Prime brings new light to the world of protein chocolate bars. You do not need to compromise between high protein content and delicious creamy flavor when you would like to eat a protein bar. 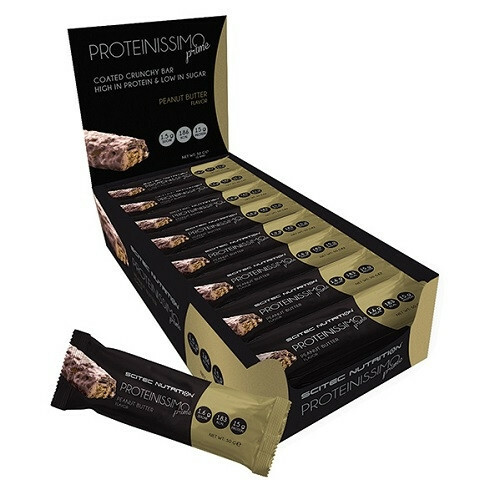 This new generation protein bar is perfect for around the workout consumption, because of its nutritional values, but you can have it at any time during the day as a guilt free dessert. Kasutamisjuhend Süüa 1 batoon päevas soovitavalt pärast treeningut. Peanut butter flavor: Milk Chocolate Coating with Sweetener (31%) [Sweetener (Maltitol), Cocoa Butter, Whole Milk Powder, Cocoa Mass, Emulsifier (Soy Lecithin), Flavor: Natural Vanilla], Caramel Layer with Fiber (18%) [Polydextrose (Fiber), Condensed Milk, Cocoa Butter, Humectant (Sorbitol), Emulsifier (Mono and Diglycerides of Fatty Acids), Natural Flavor, Water, Salt, Color (Plain Caramel)], Milk Protein, Collagen Hydrolysate, Soy Crispies (9.0%) [Soy Protein Isolate, Rice Flour, Barley Malt Extract (Gluten), Salt], Humectant (Glycerol), Soy Protein Isolate, Water, Coconut Oil, Fat-reduced Cocoa Powder, Flavor, Sunflower Oil.